Set a good example. First and foremost, you need to set a good example for your child. Be a good role model and eat healthy as well. Your child won’t be encouraged to eat healthy if they see you eating an unhealthy diet as well. Prepare home-cooked meals. It may be tempting to just order takeout meals, however, remember that those meals have more unhealthy fat and added sugar which can have a negative impact on your child’s health. So, choose to prepare home-cooked meals instead. Not only can you prepare nutritious and well-balanced meals, but you can also have peace of mind knowing that the ingredients you are using are fresh and healthy since you picked them out yourself. Prepare healthy snacks. Instead of snacking on sweet candies, chips, soda, and other unhealthy treats, prepare healthy snacks instead. Keep plenty of vegetables, fruits, and healthy drinks (e.g. pure fruit juices, milk, etc.) on hand. Don’t ban sweets and junk food entirely. Banning sweets and junk food entirely will increase your child’s craving for it. So, instead of banning it completely, just control how much they can eat and when they can eat it. Get your kids involved. When you are grocery shopping and preparing meals, try to get your kids involved. This is a good opportunity to talk to them about healthy meal options and how to read food labels. Also, it is a good way to excite your child into eating – after all, who wouldn’t enjoy eating something that they helped pick out and prepare? Be realistic. Be prepared for resistance – your child may not immediately warm up to the idea of eating a healthy diet. Set realistic goals and introduce gradual meal changes. This will allow your child to slowly adjust to their new diet. Start small and build from there. These are just some tips from us at Sharon Baptist Head Start. We are a provider of Head Start Pre-K in Bronx, New York and we hope that our expertise in child care and education can help you and your family. 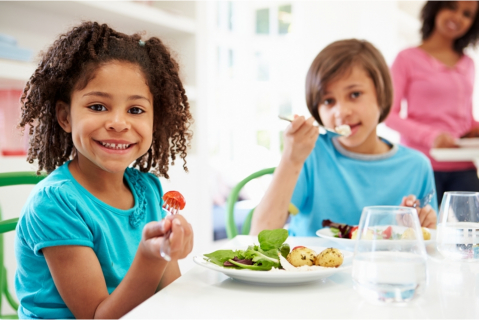 Keep these suggestions in mind and enjoy eating healthy meals with your child. This entry was posted in Healthy Eating Habits and tagged Child Care, Healthy Diet, Nutrition. Bookmark the permalink. Thank you and sorry about that, jamesGat. I’ll see if I can determine what happened to your comment.